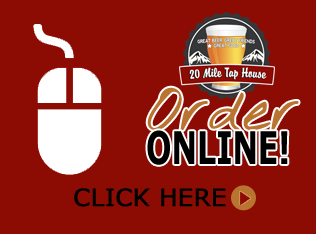 Online Food Ordering Now Available! Everyone needs a neighborhood pub. 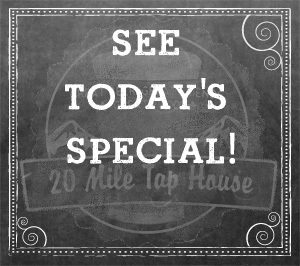 Here at 20 Mile Tap House, our concept is simple: We believe that Great Beer, Great Friends and Great Food make a winning combination for our friends here in Parker and the Denver Metro area. 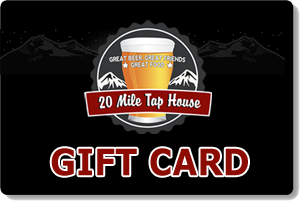 20 Mile Tap House features the best beer available – in the city, state and region. With 18 beers on tap, we focus on local, Colorado craft beers and spirits, proving to support the local economy. Our excellent food selections on our fantastically affordable made-from-scratch menu use only the freshest ingredients – all in a casual neighborhood setting. Even more amazing, we have Parker’s best covered patio with mountain views, two TV’s and two fire pits – a great place to enjoy our beautiful Colorado sunsets. Are sports your preference? Then you’ve come to the right place. We have the NFL Ticket and Big 10 Network so you can watch all of your favorite games on our 18 big screen TV’s! And if you like live music, 20 Mile Tap House has great live music. So pull up a bar stool, order up a pint and settle in – at 20 Mile Tap House, you’ll never drink alone.